Still in an indecisive phase ? My forebears used to wisely say that ” Ειδεναι Ορεγεται ” is in humans’ nature; Aristotle Metaphysics. Just have a look at the ‘Travel Leisure’ American magazine where Santorini (Thira) made its way to the list of Top Islands . Selected out of thousands of islands from all over the world,rightly gained its distinction for its quaint beauty. It stands with pride on the remnants of a volcanic caldera in the Aegean sea, receiving its visitors with agreeable warmth and plenty of attractions. However,we shouldn’t push aside the other little gems which are scattered all over Greece in the Aegean and Ionian seas,shining in the turquoise crystal clear waters, while reflecting their greenish and blueish tones.They look like basking dolphins of different species that vary in size or like emerging Aphrodites from the sea-foam. Most of them known since ancient times, with glorious history and culture behind them and perpetual sunshine beyond the reaches of Gods. They are also renowned for the idyllic moments of the sunsets,when the skies are vibrantly painted with tawny to brownish-orange shades and tones. Sometimes, when I am looking at the map,they remind me of a huge ‘smorgasbord’ with an abundance of choices that makes the pick unbearably challenging … They are all there, restful and very blue,with balmy sunny weather,to satisfy all the trends and desires,even the most exquisite penchant. Discover new oceans with unfathomable beauty that it is waiting for you to explore and appreciate.Being in those little islands and experiencing primitive values, it gives you the sensation that you travel back in time when once life was more humane and relaxing.Nowadays,simplicity is lost in the rush to become modern and ritzy and privacy tends to become a luxury. Fancy yourself isolated on a sandy beach with sheltered bays and coves or with green hills behind you,all ready to receive you and show you the way to the little priceless delights of life and to idle pleasures. Or,wandering in cobbled paths or narrow streets of undeniable charm, almost squeezed between little, white-washed houses,souvenir shops or medieval stone houses.And,and … last but not least,what about having some anise-flavoured ouzo,either in a shot glass or in a bigger one with some cold water and ice cubes that turn it into a milky white refreshing drink to go with the appetizers that the seaside tavern(a)s (small restaurants ) usually serve as light summer dishes.Trust me,there is nothing better than a dish with octopus,sardines,fresh summer salads and many other titillating delicacies. Yes,the Coast is Clear … and Scented with Basil fragrances which march to the beat of the waves … and to my puns. 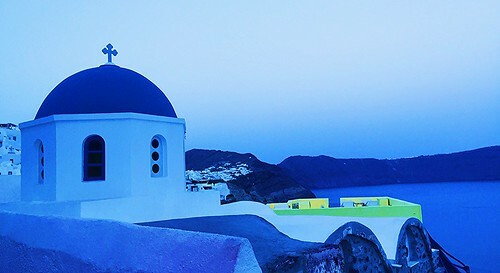 Reflective thoughts by the seaside,through the Magic Spectrum of Blue and the Spirit of the Greek Islands. Beautiful. Many years ago, we made a cruise to Santorini from Crete. It was an incredible experience, which will stay in our minds. I especially remember the stairs, which we walked down from the top to the cruise ship. 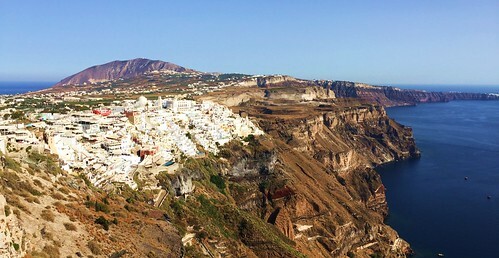 I am so glad you managed to visit Santorini and Crete.Santorini is my favourite volcanic island,its beauty is unique. But I thought to look in your archives and was delighted to arrive within your beautiful Island again which holds so much Spirit dear Doda. I Love your painting, and how beautiful are those views my friend.. Would that i could dive into that clear warm ocean and swim right now.. I am sure it would ease my aching back which I have as I overdid the gardening today. Sending my thoughts in the early hours.. and much love across the ocean. Oh dearest Doda.. so good to hear from you my friend.. 🙂 Massive big smile on my face.. And not a great deal you have missed. as I have had more problems on and off so not posted as often.. No need to catch up.. Just the current post will do.. The Greek islands are out of this world ! Tasos and I send you our love from Serifos and I am looking forward to seeing you again. We totally enjoyed your post. Perfect,is just the word to describe this beauty, i loved the basil next to the shore. Are all these photos from Santorini? Hope your holidays were to your expectations,full of inspiration and sunlight to help you with your exceptional spiritual work. Your B&W ‘Entombed Queen’ and the ‘White Waves’ are so poetic ! Thanks for coming by and commenting.You always choose words with care and acute discernment. i’m not sure about that,beacause ithaki isnt visible from Pantokrator,is it? ?yes,ithaki:the home of odysseus in Homer’s saga!did u know that Vathi(the capital of Ithaki)is one of the biggest natural harbours of the world? Hi,Dr.Lucas!Thanks for saving us the trouble of trying desperately to spot you and Anastazia in Paxos beaches from Corfu, Mt.Pantokrator. No notice was given for your re-arranged travel plans. Well, ‘as you set out for Ithaka hope the vogage is a long one,full of adventure,full of discovery ….’and more lyric words from Constantine Cavafy. Hi Doda, Your description of Greece leaves my mouth watering for the sight. Greece has always been the place which I most wished to visit. I think of it in white, white whites and lovely blue doors. I live on a very beautiful mountain and have lived many other wonderful places. But, I always dream of other spots. I have learned so much about Greece from your blog. Makes me feel more like I have been there. I am not a tourist, but, rather, enjoy living in a location for awhile and absorbing the culture. Thanks for your wonderfully sensitive blog. As I sit here with the rain thrashing against the window and the temperature struggling to get into the mid teens I am even more in need of my annual Greek ‘fix’ so abandoning my plans seems unlikely. If Athens looks as though it might be uncomfortable I can get an alternative flight to the islands and rearrange the itinerary to suit. At the moment the plans are coming together nicely and the schedule is – Paros, Amorgos, Koufonissia, Ios, Anti-Paros and Athens so if I have to get a flight to Santorini or Mykonos there shouldn’t be the need for too much readjustment. Last weekend I went to Rome and sweltered in a heat wave – today I have a pullover on! Undeniably,your annual Greek ‘fix’ revives your proud spirit and inspires your vibrant writing. Looking forward to your new pages from the ‘book of life and history’ in the Summerland of the Aegean Greek islands. Santorini is a nice island but for me is spoilt when it is overrun by temporary visitors from the cruise ships, when I was last there there were four in the caldera and thousands of people clogging up the lovely little streets. Personally I prefer islands without airports which makes them more challenging to get to. My favourite is Amorgos, or is it Anti-Paros or Sifnos or Thassos. Perhaps it isn’t really possible to have a favourite because they are all such wonderful places. I like the smorgasboard analogy! No objections.Think that I am Greek, yet,all my visits to Santorini were springtime in order to avoid the hordes of tourists. It’s obvious my friend that the spirit of the Greek islands and their long history ( most of them prove their presence since prehistoric years) are in your heart and even if you wanted to hide it,your rich posts betray your favouritism. What I like about your countless visits,is the fact that you don’t come to enjoy only the skin-deep pleasures but you also delve into history and culture. By the way,are you eventually thinking of re-arranging your summer plans ? British are basically rationalists.Use your aptitude and make a cool decision. Summertime…yes,and the famous Greek islands are and will always be popular destinations.They are ready to welcome us and fulfill their promises to our great expectations.Paradise-like,with wonderful beaches and plenty of attractions,to make our holidays highly memorable. Thanks Lady D for views and comments. And,if we are lucky enough,we might spot Dr.Lucas and Anastasia in Paxos from Mt.Pantokrator (LOL).